Three formats of pennants in several cord-lengths are yours along with volume discounted prices. 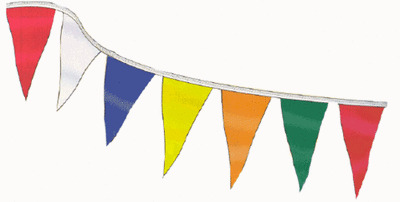 These high-impact light-weight 4-mil colored pennants (sometimes called poly pennants) on a string are made available to you in a variety of colors and sizes. Take a look and decide on the pennant size and color combination that your business or event needs.